Cara sat on a catwalk, the shadows obscuring her as she watched the smuggler unloading his ship. She’d noticed him last night, handing out bread to a few orphans in the marketplace. He looked nice, so she’d followed him so she could get a look at his ship. She wouldn’t have dared with some of the smugglers, but this man she trusted as much as she could trust anyone. His ship was a newer model, sleek and pristine. If she ever got her hands on a ship half as good as this one, she’d be happy. It wasn’t quite fair, she told herself. She liked flying. When she was five Foundings old, she’d snuck on board a trade ship for a round trip to Zirconia and back. But, being an orphan, she’d never be accepted in a flight school, even if she had enough money to pay for the classes. Maybe this guy would give her lessons. He’d handed out food, hadn’t he? That was more than any of the other smugglers, or even the honest merchants, would do. It was strange that he would care about the orphans, yet disregard the Peace Council’s laws. Footsteps echoed in the corridor. Cara stood up and leaned over the railing. Three Enforcers strode down the row of docking bays toward the ship. She looked back at the stack of boxes. The smuggler had gone inside. She bit her lip. Did she have time to warn the smuggler? The smuggler ducked out of his ship just as the Enforcers reached his stack of cargo. They stood facing each other for a moment. Cara could see the smuggler’s face, his blue eyes calm, his muscles relaxed. Didn’t he understand what the Peacekeepers were there for? Pieter. So that was his name. Cara expected him to make a run for it, or dart back inside his ship and try to escape. Instead, he nodded and spun around to receive his handcuffs. Cara gently slapped herself. Had she just seen what she thought she’d seen? Who in their right mind would just let himself be arrested? As the Enforcers led Pieter away, Cara jogged along the catwalk to keep up. There had to be a way to help him. And by the Whale, she was going to find that way. The final break in the case. I take a sip, the bourbon anesthetizing my tongue. She lied to me—it was her all the time. Level in the bottle slightly lower. The light through the bottle glows amber. My oath to uphold the Law? Swish the alcohol around in the bottle. Slide the bottle back and forth on the table. …until death do us part. Jax crouched behind the rock, sweat dripping down his back. His hand twitched around the spear held tight against his shoulder. The familiar click-click was getting louder quickly; the bug was close. He stiffened and adjusted his grip on the spear as he anticipated the appearance of the beast. When it sensed his presence, it would rise up on enormous black legs, giant pincers threatening. But the triangular section of tender underbelly would be exposed—for one critical moment. Jax breathed deeply to calm himself. Even putting his family in danger. Then that morning came. The enforcers barreled through his front door, and Jax was dragged out of his home, hands and legs shackled. The anger in his wife’s eyes had hurt. The fear in his children’s eyes had nearly killed him. He didn’t have to think twice about the offer from the government. 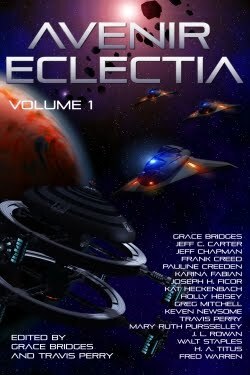 Tell all about everyone he’d been involved with, every detail of their crimes, and be set free on Eclectia. His death was faked to take his accomplices off his trail. Of course it meant giving up his family, but it ensured their safety. The clicking intensified, jarring Jax out of his thoughts. Every muscle in his body tensed. A roar erupted from the other side of the rock. Jax counted, one, two, three… He jumped to his feet and aimed as the creature reared up. The spear left his hand, arced over the rock…whoosh…and lodged into the exposed flesh. The giant beetle screeched and dropped straight down, shaking the earth beneath Jax’s feet. He stared as the beautiful, dying beast twitched, its legs curling and scraping the rocky ground. Then he lifted his gaze skyward, tears burning the corners of his eyes. Ernsto Mons slid the fifth mini-torpedo into his bandolier, laid out on the stained mattress in a cheap hotel in the deepest part of Zirconia. His weapons included the guided torpedo launcher, wickedly sharp hooks attached to duraflex netting, ten sonic stun grenades, a tranquillizer gun loaded for underwater use, some of its tips poisoned and some not, and a steel curved knife nearly big enough to qualify as a sword. His gear also included his armored dive suit, specially designed to allow him to face the high pressures at depths of six kilometers. But that was stored in the third storage cell on the right from the nearest airlock into the city, the one at the very bottom, one little-used due to the incredible water pressure and complete blackness of the depths outside. He fingered his five platinum coins—these would bribe the enforcer at the entryway. The other twenty-five were for him to keep, with twenty-five more when he delivered his prey to the wizard up on Avenir. Ernsto grinned to himself. "Like you said, old man. One angel comin' up your way—dead or alive." “Captain to the bridge! Captain to the bridge!” Chris Nakamura tried to ignore the canned announcement as he watched the target slowly cross the plotting board. He heard the hatch dilate and sensed Meg, his wife and captain, dropping into her command seat. “What have we got, Chris?” she asked. “Do we need to shift orbit?” There were few things merchant captains hated more than expending reaction mass to change from their optimum economy orbit. One would think the credits came out of their personal accounts. In the case of the family-owned tanker Tau Ceti Maru, this was literally true. A chuckle behind them was followed by a gravel voice, “I’d say a mixture of the two; though, considering the captain’s open boat voyage, there are worse things a spacer could be called.” Uncle Onslow strolled forward, scratching his hairy belly. It was agreed among spacers in Avenir’s system that Onslow was someone’s uncle—it was just that no one admitted kinship. It was also agreed that he was a very fine, if unorthodox, ship’s engineer. The fact that he passed up a number of sweeter offers to sign on the tanker was put down to his natural contrariness. Chris colored. He hated it when he got a case of the “dumbs.” He powered up the instrument. Twenty seconds later a red and blue strobe appeared against the star field. Minutes later, the target moved into the sunlight. Husband and wife both gasped as the human figure appeared. Oddly, though it sported the red and blue strobe, it didn’t display the bulk one would expect with an environment suit. He slipped behind a support column. He couldn’t chance anyone seeing him, not even a homeless child. But pity tugged at his heart as he watched the tattered urchin pull scabbed knees to a skeletal chest. Tears streaked through grime on the boy’s cheeks. Spiner leaned his forehead against the cool metal beam. “You can come out, sir. It’s okay.” The boy’s voice squeaked mouse-like. He couldn’t have been more than seven years old. The boy nodded but didn’t meet Spiner’s gaze. “I won’t tell anyone you’re here, even if you don’t feed me,” he said. Was he only seven then? Such a big word for a little boy. The boy’s “yes” was barely audible. One corner of the boy’s mouth tugged up into a half-smile as hope sparked in his eyes. Tennant gained the rim of the lava sea with a final crunch of his boots and paused for breath. He never tired of this moment, giving colour to his otherwise dreary life: moving from the sealed habitat on the broken planet’s regularly curved surface, to this, literally the end of the world, where the sphere had cracked into craggy, uneven halves. He turned his face straight up and beheld the other major remnant of the cataclysm, a huge sky of lava that threatened to fall on his head. Swathes of rubble danced around it and in the gap between Sheba’s halves. He blew out a breath, fogging his faceplate, and returned his gaze to the task ahead, fighting vertigo. Tennant glanced at his partner, then stepped forward from the volcanic grit into the maze of scaffolding at the edge of the abyss. Iridium ore: the “batteries” of Avenir, partly present in the crust of the more habitable planet Eclectia that now loomed beyond the incredibly distant horizon ahead. They attached their harnesses and turned to back down the first ladder. The Avenir station glinted there in the bright light of Ceti 94, and off to the right he spied the lesser glow of its distant twin star before the rock blocked his view. They reached the tunnel entrance and unhooked themselves in turn. Tennant allowed himself one last, long look over the wild and ever-shifting sea of lava still miles beneath them, before he spun and entered the mine to begin another long shift. Cool, smooth metal met Ave’s fingers as she slid down the wall to sit in the corner. No one would bother her here in this obscure corridor—not for a while, at least. She concentrated, and felt the distant, almost intangible vibrating of the station. Its comfort calmed her, and she hummed to herself, head down, hair shutting out the world and thoughts of Smith. A good kid, but they were both too young—only fourteen Foundings. * And the children—the beggars, the poorest of all beings, who didn’t even have a claim to parents—they looked up to her. She must do right, and not be distracted by an obsession for love, as heady as it was. The time was not yet come. Ave recognised the tune she hummed, and smiled a little: her name-song, and that of the colony. “Arise, Avenir Eclectia; be strong, Avenir Eclectia. Stand firm, Avenir Eclectia; live on, Avenir Eclectia.” A rousing anthem that gave her the tingles. Her first carer had given her the name of the entire colony: Avenir, though she went by Ave. She placed her hands on the floor, felt her connection to the huge space habitat and the presence of the planet below, and hoped she hadn’t hurt Smith beyond repair. He’d understand, someday. Wouldn’t he? The beings on the planet called to her and she rested in their mental embrace, sensing only the living station through the cool, smooth metal. Click here for the Eleon song she is humming! *A Founding being every 15 months, her age is close to 17.5 Earth years.